Today another anniversary marks the assassination of President John F. Kennedy. President Kennedy’s campaigns and later writings inspired me to become involved in political issues as a young man and a portrait of the president hung in my bedroom as I walked the streets of Portland passing out flyers for Walter Mondale in 1984. We didn’t win in that year (or for several to come) but the vision President Kennedy laid out for America still drew me in – even 20 years later. I appreciate so much how many of the Kennedy family have become leaders in social justice campaigns. 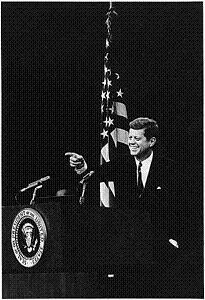 I invite you to visit the web site of the John F. Kennedy Library and Museum and to see (maybe for the time) what a difficult task he faced as president during those times. My hero worship of the former president went right out the door once I’d developed critical thinking skills. But I still greatly admire the vision he offered the world of peaceful progress.